I have a guldmate who is literally obsessed with mounts, and finally got her Bird mount from the Sethek Halls. Grats Genowen. This is the one item that I think she’d never get tired of, and would strike fear and loathing into her guildmates. Which is kind of par for the course. I’m thinking of Nesty (one of the resident Shadow Priests) as the target for this. 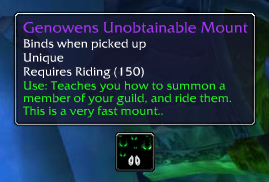 This entry was posted in Humour, Warcraft and tagged Druid, mount by Typhoonandrew. Bookmark the permalink.